Coupons are often included in shipments to be used for savings on future orders, and redemption couldn't be easier! 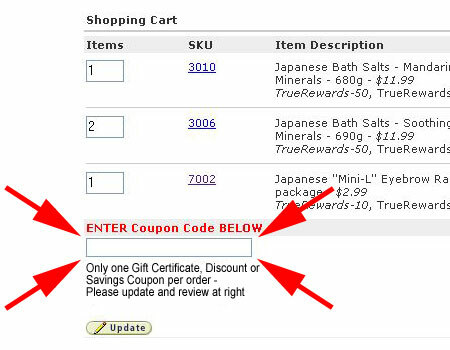 Before checking out, enter your Savings Coupon (or TrueRewards Coupon) in the box provided in the lower left-hand corner of your Shopping Cart -- see the screenshot below. Be sure to click the ''Update'' button next so that your shopping cart is updated with the coupon benefits. Click Here to go directly to your shopping cart now.